Saturday afternoon’s contest against Adrian College proved to be rather ironic. On Thursday, Lakeland University Head Football Coach Colin Bruton commented on Muskies Matters that he didn’t care if his team won 70-60, as long as they won. Saturday afternoon’s affair wasn’t that high scoring, but it did produce 87 points as quarterback Michael Whitley threw for seven touchdowns in the Muskies 47-40 victory over the Bulldogs. That moved the team to 3-2. Adrian College received the opening kickoff and was forced to punt after four plays. That put the ball in the hands of the Lakeland offense, and Eldrada Meeks got the drive going with three straight runs, gaining 32 total yards. After a Dezmon Eddie run for 14, two successive plays yielded no yards, setting up a third and 10. That is when quarterback Michael Whitley completed a 31-yard pass to Jamal Hawkins-Sconiers for the touchdown to make it 7-0. After being forced to punt on their first two possessions, the Bulldogs would get on the board, tying the score at seven. It was the running game that led the way, as David Nutter and Emmanuel Stewart combined to carry the ball on eight of the first nine plays of the drive. The big play on the possession came on third and 5 at the Lakeland 44 when Clayton Uecker completed a 25 yard pass to Jerron McGaw to the 19 yard line. Six plays later, Stuart bolted into the end zone for the two yard touchdown to make it 7-7. The Bulldogs euphoria was short-lived, as Larry Rivers returned the kickoff 69 yards to the Adrian 18 before he was pushed out of bounds. On the next play, Whitley found Jody Harrison for 18 yards and the score to make it 13-7. A 39 yard field goal by Cameron Cook made it a three-point game, and the Bulldogs would take the lead on their next possession. After taking over on their own 49, Adrian College moved the ball to the Muskies 25 where it was first and 10. Nutter then took the ball on a sweep and raced to the 5 yard line before he was finally tackled. Stewart scored his second touchdown of the game on the next play to make it 17-13 and the momentum was beginning to swing the direction of Adrian. Just before the half, the Bulldogs extended their lead to seven. Once again, using a short field, Adrian moved from their own 42 to the Lakeland 30 yard line where they were faced with a fourth and 4. Cook drilled a 47 yard field goal to make it 20-13. The Lakeland Muskies received the opening kickoff of the second half and marched 75 yards in 10 plays to tie the score. After Whitley completed two passes to Meeks to start the drive, the team would be unable to move the ball on the next two plays. That set up a third and 10 and, once again, it was the combination of Whitley to Hawkins-Sconiers that delivered the big blow, first a 43 yard strike that moved the ball to the 18, followed by an 18 yard pass play that put the ball on the three. It looked like the Adrian defense would hold, as an incomplete pass and two runs made it fourth and goal at the three, but Head Coach Colin Bruton rolled the dice and Whitley delivered, completing a pass to Dezmen Morse for the score to tie the game at 20. Adrian would retake the lead with 4:24 left in the third quarter. A 24 yard punt went out of bounds at the Lakeland 34, giving the Bulldogs incredible field position. They moved to the Muskies’ nine where they were faced with a fourth and 8. Cook connected on a 26 yard field goal to make it 23-20 Adrian College. The Muskies responded right away. After an 11 yard completion moved the ball to the Lakeland 36, Whitley kept the ball and raced for 6 yards before he was tackled. On the next play, the Lakeland QB hit Eddie who then raced the distance for the touchdown to give Lakeland a three point lead. That sent the game into the fourth quarter, which looked more like a Wild West shootout than a football game. After Cook tied the game with a 21 yard field goal nine seconds into the quarter, Whitley led his team on a 72 yard drive that lasted six plays and 2:33 off the clock before they would retake the lead. It was a 54 yard strike to Eddie once again that led to the touchdown to make it 33-26. The Bulldogs responded right away to tie the game. Starting from their own 22, they were able to move to their own 44 where they were faced with third and 3. Uecker handed the ball off to Stewart, who broke free and raced 56 yards for the touchdown to tie the game at 33. On their next possession, the Muskies retook the lead. Eddie’s 39 yard kickoff return put the ball at the Lakeland 40. On third and 10, Whitley completed a pass to Harrison for 28 yards to the Adrian 32. 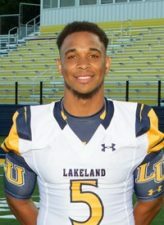 Two plays later, the Lakeland University quarterback ran for 14 yards to the 18, and a Whitley swing pass to Meeks allowed the running back to gain a little room and he raced toward the end zone for the 18 yard score. On their next possession, Adrian College mounted an impressive 13 play, 86 yard drive to tie the score. Three times the Bulldogs were faced with a third-down situation, and converted in each case, including a third and 17 at their own 33 when Uecker passed to Stewart, who made it to midfield for the first down. On first down at the 15, Nutter made a nice move before out racing the Lakeland defender for the end zone and the touchdown to tie the score at 40. There was just 2:50 left in the game, but anyone who is familiar with Lakeland University football knows that is plenty of time for Michael Whitley. After being tackled for a 2 yard loss on the first play, Whitley connected with Harrison for 38 yards down to the Adrian 29 yard line. Two plays later an 18 yard completion put the ball at the 11 before the Muskies quarterback passed to Eddie for 11 yards and the score. That was Eddie’s third touchdown reception of the game and the seventh touchdown toss by Whitley. That left just 56 seconds left in the contest, but the way this game was going that seemed to be plenty enough time. Uecker was sacked on the opening play of the drive and had to leave the game. That brought Hunter Hamm on, who completed two huge passes, one for 25 yards and the other for 17 to the Lakeland 29. Two plays later, he completed a 12 yard pass to McGaw for the first down at the 17. That left time for just one play. Hamm went back and fired for the end zone, but Oman Smothers picked it off to end the game and preserve the seven point victory. Michael Whitley led the Lakeland offense with 433 yards passing and seven touchdowns. Dezmon Eddie had just three catches, all of which went for touchdowns and 123 total yards. He also had two catches for 14 yards. Jody Harrison had six catches for 108 yards and a score, and Jamal Hawkins-Sconiers had three catches for 92 yards and a touchdown. 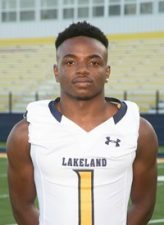 Jeremy Stokes led the Lakeland defense with 11 tackles. The two headed running attack for Adrian College had a huge day. Emmanuel Stewart ran for 168 yards and three scores on 27 attempts, and David Nutter had 155 yards and a touchdown off of 26 carries. Next weekend, Benedictine University comes to Taylor Field to take on the Lakeland Muskies for homecoming. Kickoff is scheduled for 1:00.